Song Young-hee, 47, is CEO of social enterprise N Visions and a person who finds his way through the darkness. 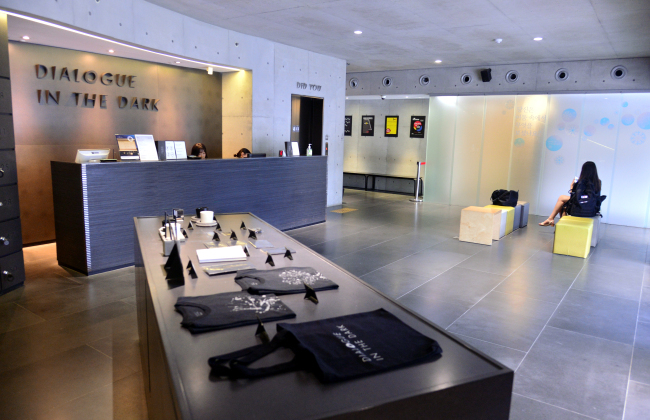 He also created that darkness, bringing the exhibition “Dialogue in the Dark” to Korea. 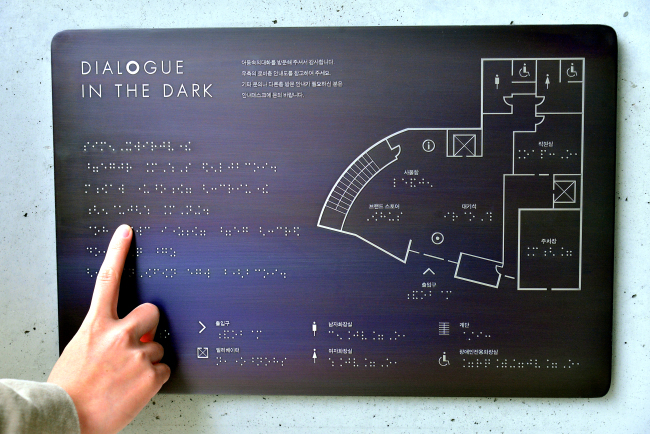 “Dialogue in the Dark” is an awareness-raising exhibition. Though an exhibition, there is not a hint of light in the exhibition space. Participants do not use their eyesight for 100 minutes. Guided by the “Road Master,” the group of participants listen, feel, taste, smell and, most importantly, imagine their ways throughout the darkness. The unfamiliar setting both restricts and frees participants. Though participants are afraid to take a single step at first, growing familiar to the darkness they can go beyond the restrictions of time and space -- riding a boat, visiting a market, walking through a forest -- in the small black room. “Visiting the exhibition in 2007, I could not sleep at all that day. It was fate,” Song told The Korea Herald in his office in Gahoe-dong, central Seoul. Before that he had worked as a piano tuner and a stenographer after losing his eyesight at 19, but the jobs did not fully satisfy him. It was like destiny, Song recalled. 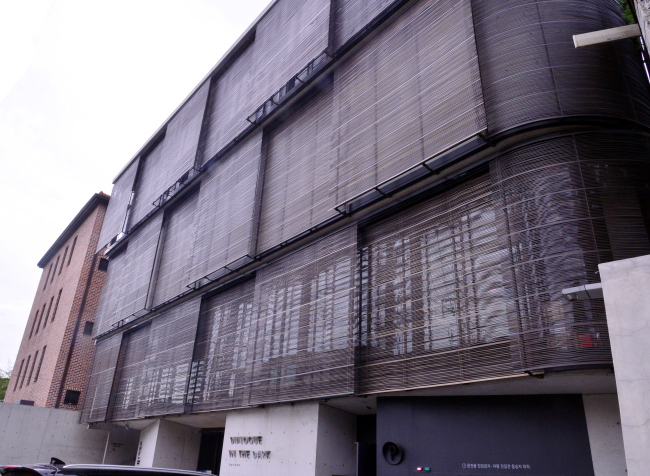 At the time, a local production agency was hosting the exhibition temporarily in Seoul Arts Center in southern Seoul. Awed by the exhibition, Song asked the agency to bring him on as a guide in the dark. But after some time, the exhibition had to close due to financial reasons. With those who understood his passion for the exhibition, Song and three others sought ways to bring the exhibition format to Korea permanently. Along the way, they started social venture N Visions. In 2010, with support from web portal giant Naver, N Visions was able to start the exhibition in Sinchon, western Seoul. Now, the exhibition is held in Gahoe-dong. The exterior of the building reflects the exhibition, decorated in matte black material -- a reinterpretation of darkness. It is currently available in 21 countries in different formats. The format reflects local cultures. For example, participants ride on a tuk-tuk in Bangkok, and take a metro in New York. “The overall idea is to reflect the daily life of each country and to bring unfamiliarity out of something familiar,” Song explained. Though the exhibition was launched to raise awareness regarding blindness, it enables the visitors to realize much more, he asserted. Communicating in the darkness with the Road Master, the participants are awed by the guide who leads the way confidently. The Road Master helps each participant follow the tour safely and with delight. Through the journey, participants realize that the blind are, in some ways, more competent than those who can see. Over the past few years, “experiencing blindness” has been a trend among young people. Dark cafes and restaurants, which offer complete darkness, have been popular, taking people out of their comfort zones. Song is not sure, whether he welcomes the trend or not. He went on to explain how the trend may make people more prejudiced about blindness. “The motto of the exhibition is to make people realize that blind people are not so limited. But through such experiences, people ‘experience’ darkness and think ‘Blind people must have so many difficulties.’ But that’s not why we started this,” Song said. Then why did he start all this? There is a belief central for Song -- it is a social responsibility to offer everyone diversity in choosing jobs. “When I lost my eyesight, people told me I could only be a masseur or a social worker. But we all should have the right to choose the jobs that we want to have,” he said. Reflecting the belief, N Visions now operates as a social venture, running culture-related businesses, with around 40 employees. Some are blind, others are not. Some of the staff work for the exhibition, while others work on a project for increasing web accessibility for the blind. They are test engineers for Naver, as the information technology firm works on developing a program to read out loud that is written online. Though certified as a social venture by the Ministry of Employment and Labor, Song believes N Visions should not see itself as a business that should be protected or helped out.